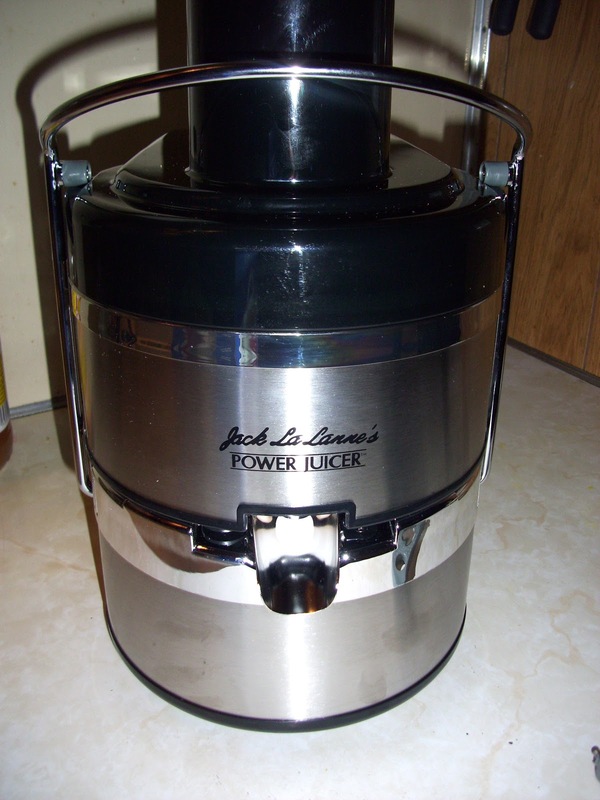 I’ve been a fan of juicing for a very long time. Almost 8 years, off and on. I’m proud to say that I’ve even done a 3-day juice fast! Again though, it was part of some kind of “quick fix” fad weight loss thing and NOT for my health. Today, Rance and I finally got to watch the documentary, Fat, Sick and Nearly Dead. The last time we watched a documentary together we changed our entire lives. Would this documentary have the same effect??? What an amazing and inspiring film!! And yup, you guessed it. We’re going to “join the reboot”. What’s the reboot you say? Check it out for yourselves, here. For free! In a nutshell, we are going to be following our normal, healthy, clean,Vegan lifestyle but incorporating fresh juices, from home. The “reboot” refers to the juice fasting part of it that a lot of people do in efforts to clean out their systems of all the addictive cravings for processed and refined foods before starting a healthy lifestyle. 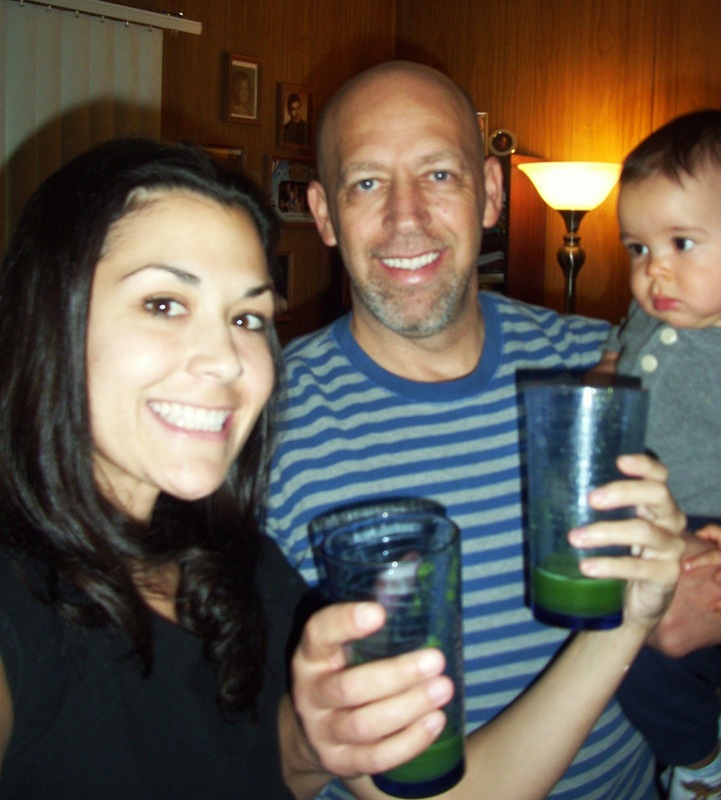 The guy in the movie did a fruit and vegetable juice fast for 60 days! Others did it for 7 or 10. I believe that since we already live a fairly clean Vegan lifestyle, a long term juice fast isn’t necessary for us to reap the benefits and reboot us for health and maximum energy. The website has plans for everyone! You don’t have to worry if you can’t fast for days on end. You can simply incorporate juices into your current lifestyle and ease into it. We are making our own version! You should too! That being said… We’re starting! Not tomorrow. Not Monday. TO-DAY, my friends! And we’re taking you guys with us! What better way to tell and show others, then through my blog? Everyday I will post what we ate and what we drank so you can follow along, take notes, be inspired or be an angry hater. Whatever you choose is entirely up to you! Our first green juice for lunch! We both got a crazy energy rush! It was spinach, ginger, lemon, celery, cucumber and green apple. Today, we had a juice for lunch. I have a bean, greens and brown rice taco soup in the crockpot for dinner. Tomorrow we will be having a juice for breakfast, lunch and for snack. Dinner will be another micro-nutrient packed, clean, Vegan meal. Come Monday, things will change slightly. Rance works over an hour away and juicing during the day isn’t feasible for him. His plan is to juice before he goes to work in the morning (replacing breakfast). Then have his usual fruits, veggies, beans and nuts during the day and a light Vegan meal with me at home. With possibly another juice before bed. He is so gung-ho about this thing he says, “If we do this, we’re going all the way. Take the coffee pot and put it in the shed. I’m going to replace it with juice!”. This is coming from a man who LOVES his coffee. Um….yeah!!! I was shocked and scared and proud all at the same time! Ahh, I love that man of mine. I sprouted these myself in a sprouting jar!! Why would anyone want to do such a thing??? Look it up! 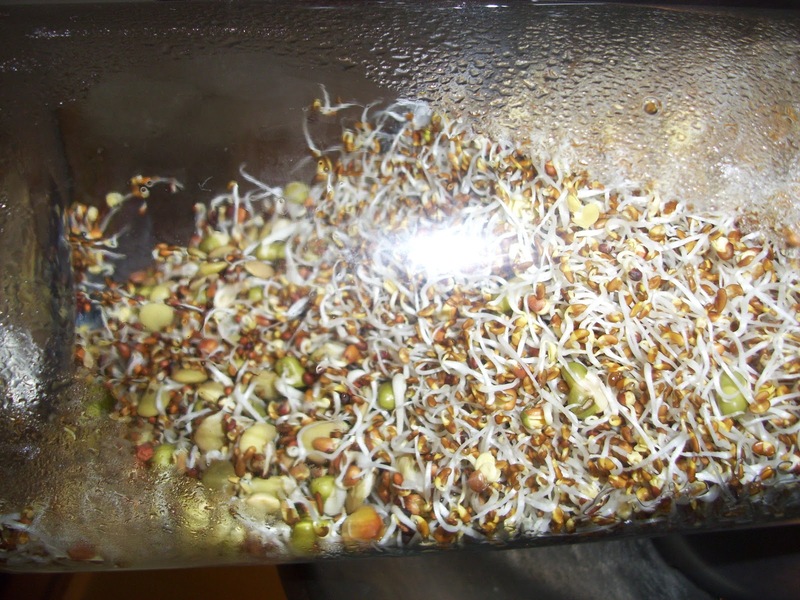 Sprouting is not only cheap to do but the health benefits are amazing! Here is an article you have to read. I was reminded because everyday I have Riley help me with the seeds. We rinse them and watch them grow together. He can’t wait for them to be ready to eat. It’s really exciting to see him WANTING to take part in all that we do. It makes me feel good as a parent. Better sprouts then video games I say! I know…I’m turning into such a hippy!! But, I’m loving every minute of it!! I can’t wait for all of you to come on this juice journey with us! WOOHOOO!!! Next Post All that and a side of Vegan Caesar dressing!